As we move into February, the weather is doing its own Groundhog Day routine. The weather seems to be stuck like a needle on a record, playing dry, warm weather over and over again. Use this space to discuss any changes you see coming down the pike. 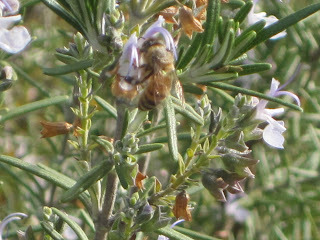 TMF's CEO took this picture of a bee picking over faded blossoms of a rosemary plant in northern Virginia (outside of DC) on Feb. 1. Unbelievable!!! Q: What would you be doing if you weren’t working as television meteorologist? A: I have no idea. Well, I guess I’d have worked in the family business in San Francisco, where I grew up. It was a mens and boys clothing store called Young Mans Fancy where everyone in San Francisco went as a boy to get their first suit. That was kind of my path. But when I was working at the store I also interned at local TV stations in San Francisco and my grandparents didn’t know. They would have been like, “Weather? You like weather? We don’t like weather. This is what you’re gonna do.” I loved the tradition of the store but I knew the retail industry was kind of going like this [he motions downward] and I had this passion for weather since I was two. I had to do it. Q: How did you go about pursuing a career in weather? A: When I went to college, USC did not offer a degree in meteorology. I also had an interest in urban planning, still do, and became a teaching assistant in the Geography Department. The Geography Department had some of the weather classes. So that at least got me into weather even though I didn’t major in it. When I got out of college, I went into real estate office leasing in San Francisco. Then I went back to work at the store. And that’s when I said, “OK, I got to do this.” I got my AMS seal in 2002. I didn’t get my first on-air job until I was 26, which is later than people who get weather degrees right out of college. Even though I knew what I wanted to do, I had a different way about getting there. Q: How did your career evolve from there? A: I got my first on-air job in Chico, California in July 1996. I thought I’d be there for six months. But it was a party school, and at the time I was 26 and I’m like, “this is awesome.” I’m reliving my college life. Four years later, I’m still there and I’m the chief meteorologist and everything and then finally my buddies came to me and said, “You gotta get out of here, you’re never going to grow up.” So finally, in 2000, I left. I went to Albuquerque, then Seattle and then I did a stint in San Francisco, which was my hometown and my home market. It was for the sister station of the station in Seattle. I worked there for a couple of months, but it was only going to be kind of a part-time, temporary fill-in kind of situation… and with a wife I knew I needed something more stable. So I came out here in 2005. I’ve always dreamed about working in Minneapolis just because of the weather. In San Francisco you get some interesting weather in the winter but in the summer it’s “fog on the coast, sunny inland” and that gets old. So this market is far more challenging. And for that reason, I love it. Q: What’s it like to be a meteorologist in California? A: The weather in places like San Diego is an afterthought, and it’s just not a promotable thing. People don’t really watch it because it’s fairly predictable. Now they all have their little idiosyncrasies there. You’ve got the coastal eddy and how that affects fog. And you get big temperature variations from the coast to inland, but other than that…. 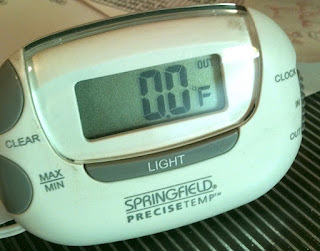 Here it was 103 last summer and the lowest temperature we had last winter was 16 below so that’s a 119 degree shift! I love that. Q: It seems like a lot of meteorologists are from the Midwest and other parts of the country that get more “interesting” weather. Yet you’re from San Francisco. A: But you know even though you don’t live in a place that has severe weather, there are still microclimates there and the weather can be as fascinating and some very well known meteorologists have come out of San Francisco. Q: What are some of the more interesting weather phenomena you observed and forecast while working in Chico? Q: How attractive is to work in Minneapolis, where snow is obviously more common than in other cities? A: When they get snow in a place like Seattle, it’s a big deal. And even though you hear people say, “It’s just an inch of snow” those hills are steep. And it does snow in Seattle. There are some years they’ll get snow five or six times. Some years you get none. But that was my draw to this place… winter. I love forecasting snowstorms and last winter I loved it. I mean how many 13-inch storms did we have? We had like three or four of them whereas my first couple of years here we were just getting this piddly stuff, and I’m like “what?” This isn’t going to work. I think we’re into this pattern over maybe the next year or two where weather swings will be more dramatic. Q: What else do you find unique about this market? A: There’s a lot of viewer loyalty in this market and, in particular, morning viewers are a little less apt to change. As the saying goes, “They don’t know who they like but they like what they know.” So having a little longevity is important, sticking around for a bit. When I first got here, I replaced a guy by the name of Jim Guy who had been here a long time. All of the sudden I showed up and people are like, “Who in the heck is this guy?” And it took a while to not only gain the respect of my coworkers but also to get warmed up to the viewers. I would say there was a Jim Guy hangover for at least six months. You also don’t find many “rip and readers” [people who “rip” the forecast from the National Weather Service and essentially just read it] in this market whereas you get that in a lot in other markets. And believe me, I’m still learning. I learn every day from Dave, from Ian, from others… I mean, I watch. Q: Do you feel like you’re an entertainer or a scientist? A: I think it’s both. At the National Weather Service, they’re very good, but they’re notoriously a little drier. They eat, sleep and live weather and are more shift oriented. Yet, I take it home with me as well. When I’m twittering at home, it drives my wife crazy! You know we’re having dinner and I’m doing updates. But did I get into this to be on TV? No. Do I like being on TV? Yea, I like it. I have a passion for this and doing it in front of an audience. You’ve got to be personable and be genuine, because the minute you’re not yourself, the minute it sounds phony, people see that. You have to be real and I think most everyone is in this market. There’s not a lot of BS here because it wouldn’t survive. Q: How has social media changed your role or your perception of your role? I don’t do much with Facebook but I love Twitter. There’s just a lot more that we can do to engage an audience. I think it’s exciting. You know some guy said, “Thanks for all the Twitter information. Now I don’t need to watch any more.” And part of me initially felt that I didn’t want to give it all away, yet if you develop a relationship they will come to you when weather happens and when it’s necessary. And luckily in Minnesota there are more of those kinds of days than anywhere else. I don’t believe you can tweet something like, “Want to know how much rain we’re going to get? Tune in at 5.” People are smarter than that. Tell ‘em, but maybe don’t give it all away. But I don’t want to just text my 7-day forecast to everybody because yea, you do still want people to watch. But if they know you, when there is a time to watch you’re who they’ll go to I believe. It took me a little while to grasp that. Chikage (Windler) was helpful in getting me to understand that. Q: How do you feel about the idea of employing confidence ratings in forecasts? I see both sides of the argument for using confidence ratings. A guy I know in Albuquerque has something called a “bust potential” because storms in the southwest can be far more fickle. He would have a forecast for the storm but he would also include a bust percentage like 30 percent that this doesn’t work out. And they actually started promoting it and it was a cute little thing and something different that other people weren’t doing. If I feel like there’s a lot of uncertainty, I communicate that by showing different models or explaining that models are showing different timing and amounts. Or I’ll say that new model information came in and while I’m not sold on it we can’t turn our back on it. But I think people think, “You’re a meteorologist, you should know.” Ultimately, I think you have to go with your gut, go with what you think and sell it. Q: From our assessments on The Minnesota Forecaster, we’ve seen several instances where KSTP’s forecasts stand out from the collective consensus of other Twin Cities weather outlets. Why is that? A: I’m glad to see that we’re not all the same, that we all have a little different way of doing things. We’re not afraid to take chances and go for it. I remember the day last summer when we hit 103. Granted, we all underestimated the temps that day, but we had 94 on Day 7 and everybody else had the low 80s. Sometimes you take a little bit of a risk. You knew there was a little bit of a chance that that warm front would have stayed south of us and we could have been cooler. But it kept showing up. When we’re wrong, or if there’s a bust, it bugs me, obviously. Even if I said it was going to be sunny and it turned out to be cloudy. I mean is it really affecting people? No. But I got it wrong. And that doesn’t sit well with me. Q: How do you feel about sharing model-predicted precipitation amounts in your on-air presentation? A: One of the things that has been a help, but in some ways a hindrance, is the fact that now we display model data which we never used to do years ago, and a lot of these systems like WSI have a built-in RPM model which often times nails it. It’s really something. However, some times it can be out in left field. And if you’ve got your forecast thinking all done and then all of a sudden this in-house model shows something different, don’t show it because you got to stick with your forecast, use it as maybe a tool internally, but don’t show it just because it looks good. One of the things that Dave (Dahl) does – and one of the things I really learned from him – was still kind of going old school. For example, when you make your snowfall forecasts don’t just throw out model data. Throw out what you’re thinking and use that as your forecast and not these models. We can become overly reliant on the models and sometimes you just have to go with what you see. Q: Do you think forecasting beyond five days really makes sense? A: Yea, I do. But I think beyond five days is really a trend. We could almost just say 80s, 90s, 70s, or mild vs. a specific temperature. But we stick with it. I think you have a pretty good handle. Are you going to forecast a 90 percent chance of snow on day 7? No. Usually our pops [percent chance of precipitation] won’t go any higher than 40 percent on Day 7. We just don’t know. But a lot of people go, “OK, we’re getting married next Saturday. What do you think?” And I always tell people it’s a week away. Here’s what I’m thinking. Call me back three days out and then we can nail it a little more clearly. Q: Given that the Twin Cities have no elevation differences and the weather is not affected by close proximity to a large body of water, do you think it’s necessary for temperatures to be detailed in all of the towns and suburbs that comprise the greater Twin Cities? A: That’s something that we talk about. Here’s the thing. There will be days where there will be a clear difference in north and south metro temperatures. There can be a warm front right through the state where there can be a huge change. And sometimes east to west. But nine times out of ten without elevation, without topography, an area that is fairly small is not gonna see a huge difference. There’s no land-sea effect. There’s nothing. But we’re reminded that people want to hear their town mentioned so if you say “In Buffalo or in Eden Prairie” that will resonate. 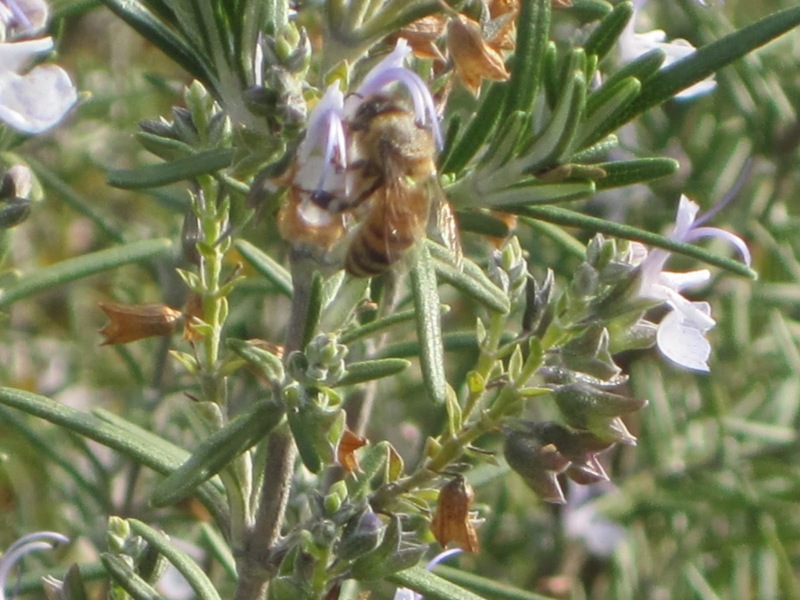 Particularly in the summer, though, it’s hard to say that it makes much difference. But in the winter it can be a different story because sometimes you can clearly see that the south metro may get eight inches of snow while there may be one in Cambridge. Now in San Francisco, they really use a lot of detail. They used to just have a 5-day forecast, but now they all do 7-day forecasts and three different ones: coastal, bay and inland … so there are many numbers up there. But you’ve got a huge difference. Q: How do you feel about going on air when there’s severe weather? I know that we all think we really like it when severe weather happens because we know we can own it. If it’s your day off, you come in and the station gets the helicopter up. When the North Minneapolis tornado happened, we set the bar very high. Dave and I teamed up and our helicopter was up showing what happened. One of the other stations stayed with golf and that really surprised me. We have a policy and I think every station has it, too. If there’s a tornado warning in the seven-county metro, you go on. If it’s out of that, you still go on but you probably cut in. Last summer during the tornado, I came in and we covered up NASCAR. People can get angry. I made the mistake of taking a 20-second break off the wall-to-wall coverage and checked my email. A lot of people were not happy. But listen, if there’s a tornado warning in the metro… if we weren’t on and somebody dies... You’re mandated to show warnings and things. We’re not mandated to go wall to wall. And you don’t do it just because everybody else is doing it. It’s just what we do. And the Hubbards [owners of KSTP] completely support it. Q: Do you foresee the day when severe weather coverage can be streamed so it doesn’t affect regular viewing? A: I think that the technology is there for us or is just about there. We could just stream it online but not everybody’s got the Internet. My goal would be to put it on channel 45. Or why couldn’t we have taken NASCAR and put it on one of our other channels? But on the weekends there may not always be all the staff here that can figure that out. As of mid-evening on Sunday night, here were the various forecasts for snow from tonight into Monday. The National Weather Service, MPR and @NovakWeather have the most bullish forecasts for snow accumulation. In the end, even the weather produced a Vikings-esque performance. In a winter that’s already established a number of daily warm records, a bigger, more significant and telling mark lay ahead. 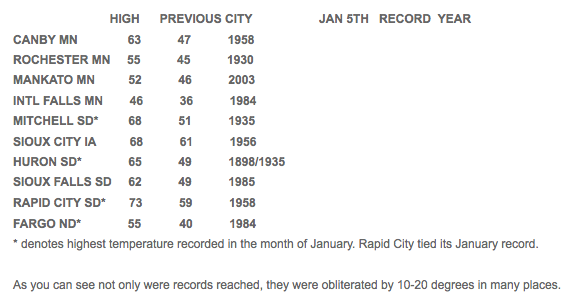 If the Twin Cities could go until Thursday, January 19 without recording a temperature below zero, it would establish a new standard for the latest sub-zero ever recorded – the ultimate warm record for this northern locale. Never in the history of the Twin Cities had a zero degree reading meant so much. The stage was set for this momentous weather achievement. As of Wednesday morning (January 18), the National Weather Service was predicting a record, forecasting temps to stay above zero until the wee hours of Thursday morning (January 19). Most other local weather outlets, while stopping short of guaranteeing a new record, were clearly expecting January 18 to be free of sub-zero temps. Even as late as early evening, The Weather Channel forecast temps to be three degrees above zero as the calendar turned to Thursday. Welcome to the first subzero morning of winter, and a record-breaking one at that. 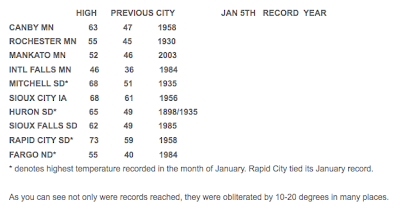 We set a record for the latest subzero on record in the metro. Indeed, the Twin Cities stood on the precipice. The champagne was on ice. Weather geeks around the metro area were looking for the Gatorade jug. However, shortly after 6:30 p.m., just five and a half hours before the finish line, the temperature began a steady decline. 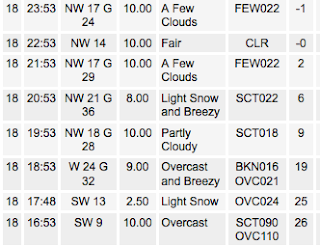 From 6:33 p.m. to 6:53 p.m. the temperature dropped nearly six degrees to 19. But that still required a further drop of 20 degrees in the next five hours. The record seemed as safe as a commanding Twins lead with Joe Nathan taking the mound in the ninth inning (well, at least in better years). Then Mother Nature began to heave a Hail Mary. The hour from 7-8 p.m. brought a staggering 10-degree drop in temperature to a bitter nine degrees, rocking the psyche of those who wanted to live through a most unlikely record. It was time to sweat; a photo finish looked increasingly likely. Official temperatures recorded at MSP airport. The prospect of setting a record grew darker with each passing hour. At 9 p.m., it was six degrees. An hour later it was a mere two. We were Rangers fans watching the Cardinals putting together a most unlikely two-out ninth inning rally. The situation grew dire by 11 p.m., when the official airport temperature dropped to an even zero. All the work it took to set the stage for this unlikely, extraordinary record for mildness was on the verge of being wasted. Lacking the ability to build an enclosed wall around the airport thermometer gauge, it was a forgone conclusion. The same destiny that produced four Super Bowl losses and a long dearth of sports champions (sorry, we can’t count the Links), was at work on the Twin Cities record books. By 11:25 p.m. the temp officially dropped to one degree below zero. It remained there through midnight, cementing a weather consolation prize that left many disappointed. Call it a defeat snatched from the jaws of victory. In weather, as in sports, a tie is like kissing your sister. At last, winter was giving local meteorologists something to talk about. As of Tuesday night, there seemed to be a consensus that Thursday would likely record the Twin Cities first sub-zero temp of the season, the latest such occurrence on record if it pans out. There was also talk of a possible snow "situation" developing for Friday, though snow lovers and other interested parties are surely skeptical based on previous forecasts this year. Although the Twin Cities is set to endure the coldest days of the winter so far (and perhaps all winter) in a mere matter of days, some forecasters are already targeting what could be a record warm Sunday a week from today. As we all know, such extended forecasts are prone to significant error (witness the fact that today's high of 40, was predicted to be 28 only three days ago), so we thought we'd put this one to the test. Per below, the spread in forecast highs ranges from 34 to 44. The record high for next Sunday is 51. Here are the forecasts we could find. We look forward to assessing these predictions a week from today. It's January 15, square in the middle of meteorological winter. Winter, as Minnesotans know it, has been slow to make its presence felt. Currently, it seems to be in the throes of a comeback, in cold if not snow. What does the rest of the winter have in store? First, kudos to you. You’ve amassed weather talent the way the Yankees acquire career .300 hitters. You’ve also done a good job positioning the cast of seemingly likable guys as a team to be reckoned with. Who can claim deaf ears when baritone Tom Barnard intones, “If it wasn’t for that, the KSTP team couldn’t have predicted a day like today.” It gives a viewer chills, much as the graphic of the four stalwart forecasters in Mount Rushmore repose does. But we’re wondering about the team concept, and more importantly, whether you’re aware that recent “mixed forecasts” are confusing us poor viewers. Specifically, we refer to the Dahl-Barlow tandem whose presentations overlap through the myriad of KSTP evening newscasts. Several times recently, as documented by commenters to minnesotaforecaster.com, their predictions have been significantly different. What’s a viewer to make of this? It’s perfectly understandable that individual forecasters come to different conclusions. We all should know that forecasting is part science and part art. But KSTP goes to great pains to convince us it’s a team effort, yet these inconsistencies leave us to wonder. Forecasters and the forecasting community often, and correctly, fault the viewer/consumer for lumping them all together under “they,” as in “they called for 4 inches of snow or they called for 50 degrees.” In reality, of course, they got confused by what they heard, from whom and when. But when one evening KSTP forecaster predicts “at least several inches of snow” and another says “maybe an inch” just minutes later, the station itself is creating the confusion. It makes us question whether there is collaboration or even an attempt at forming a consensus. P.S. Why does Ken Barlow always look like he’s racing to catch the bus when he not-so-gracefully exists the extended forecast screen? The second “event” (we use the term loosely because Thursday night/Friday produced essentially nothing) in three days proved to be an underachiever, though we do not consider last night’s rain/snow to be a bust. 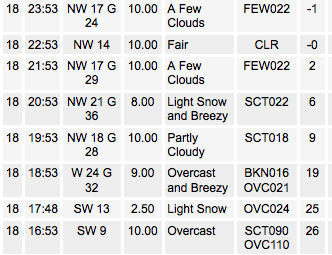 The official snow total at the MSP airport was 1.7 inches. We’ve based our always subjective grades on forecasts issued mid-morning on Saturday with the idea that that was about 12 hours prior to storm onset and were the forecasts people could best use to plan their day. Many forecasters raised their forecast snow totals later in the morning based on newer model information. MPR: A- MPR essentially nailed the storm (save for blowing and drifting snow which never materialized). KSTP: B On the surface, KSTP’s morning forecast snow totals were in the ballpark. However, we think the storm still didn’t unfold as they thought. Their forecast was for “significant blowing snow.” However, due to the fact that virtually all snow fell when temps were above freezing, the snow was heavy and wet, and blowing/drifting never materialized. FOX: C- It’s difficult to grade FOX because their website did not provide any forecast info in the morning. All we had to go on was a tweet in the late morning with predictions of 3-5 inches (and Sunday winds of 20-40 with gusts approaching 60 mph) and an evening prediction of 1-3. FOX was long on the snow estimate and as of this writing midday Sunday, the highest gusts have been 45 mph. KARE: B- KARE’s morning forecast included a snow range of 1-4 inches, a range that we felt was unreasonably wide. They tightened it to 2-3 inches by the evening newscast, which was ultimately a little higher than actual. NWS: D This was a disappointing performance by the National Weather Service. Their use of a winter storm warning seemed questionable from the start, and ultimately proved to be overkill. Strib: B- The Strib’s initial forecast of 1-3 inches was in the range. However, they swayed with the majority of forecasters and became overly ambitious based on late morning model information. Weather.com: C- Morning predictions were too low, evening predictions were too high. Accuweather: C Morning predictions of a coating to an inch were too low. Interestingly enough, Accuweather’s forecast as of 5 p.m. was for 1.9 inches, quite close to the final tally. @NovakWeather: C This grade reflects a mixed performance. Novak was among the first forecasters that we came across who saw the possibility of a New Years Eve storm of significant magnitude earlier in the week, a time when most others were pointing to wind as the most notable weather. However, Novak’s ultimate snow prediction was considerably too high. Agree? Disagree? Share your thoughts on our grades in the comments section below.